In this article I am taking over the Jacksonville Jaguars front office. I think we all can agree based on the last two years they need NO help in this area. They have had phenomenal drafts, as well as great free agency (FA) classes. The previous two years worth of moves includes players such as: Malik Jackson, Jalen Ramsey, Myles Jack, Yannick Ngakoue, Barry Church, A.J. Bouye, Calais Campbell, Leonard Fournette, Cam Robinson, Dede Westbrook (2016 Belitnikoff winner), and Keelan Cole. Based on this past season, I believe the Jacksonville Jaguars are in good shape going forward. However, here at CPGM (Couch Potato GM) we enjoy giving our take on everything NFL whether it’s Free Agency, the NFL Draft, or Fantasy Football. So without further ado, here is what I would do if I was in charge of the Jacksonville Jaguars during the 2018 off-season. We will start off by taking a look at the key impending free agents on the roster heading into 2018 New League Year. These players include Paul Posluszny, Marqise Lee, Allen Robinson, Aaron Colvin, and Patrick Omameh. Let’s begin with one of our defensive leaders in Posluszny. I would love to have him back but the price must be right. Paul is still a good starting MLB, but with the likes of Telvin Smith and Myles Jack he rarely saw the field in passing situations. This limits his value to our organization. Now consider the addition of Blair Brown (2017 draft, 5th round); he ranked #1 among linebackers in college football tackling efficiency according to Pro Football Focus prior to being drafted (96 tackles with only 3 missed) in his final year at Ohio. In my opinion Paul will get an offer to start for another organization that the Jaguars just can’t afford to match. Next up are wide receivers Lee and Robinson, both players would be welcomed back. Unfortunately, I believe the market for both players in free agency will be way too high to pursue. Lee will get a contract around $8 to $10 million annually and Robinson will have a FA market value of $15 to $18 million per year based on his ability and lack of talent at WR available during FA assuming his health checks out. These cap figures are way too high in my opinion based on value to the team, and future contracts that must be completed with our defensive stars. Now it’s time to make a deal with Aaron Colvin, he is great nickel corner who has played well for the Jaguars. With the depth in FA at corner back, I don’t believe Colvin (who only has 1 career interception) will have a large market. I’m confident I can get Colvin on a short term deal such as 3 years worth $16 to $18 million total. When you consider the chemistry and swag the entire secondary had during the 2017 season, I consider getting this deal a must, as long as the demands for his services are low like I expect. The last impending FA I will look at is Omameh, he played well not great though. I believe interior offensive line is a position that must be upgraded. Now that Tyler Shatley has been extended through the 2018 season, Patrick is replaceable. The final move I make prior to March 14th is cutting or restructuring Allen Hurns‘ contract. I don’t see him taking a pay cut willingly, most players wouldn’t. You must consider production, salary (7 million), and availability over the previous seasons. With all things considered I must make the tough choice and cut Hurns. The key to any good off-season is having a plan, and attacking that given plan. The main needs of the Jacksonville Jaguars heading into 2018 Free Agency are interior line, tight end, and wide receiver with the departures of both Lee and Robinson. I will avoid addressing this position at the beginning of FA but would consider targeting players such as Dontrelle Inman, Jordan Matthews, John Brown, and Ryan Grant later in free agency if the contract and value was appropriate. I will be going hard after two positions via free agency, TE and guard. By doing this it gives us great flexibility heading into the draft, by taking the teams true needs from three to one. The reason this is important, it allows you freedom to take the best player available instead of reaching for a position of need. Let’s start off with addressing our number one need the move (receiving) TE. My number one target is Trey Burton; I’m willing to do whatever it takes to put him in teal and black. I believe he is a Top 10 TE in the league. We haven’t even begun to see his true potential in the NFL. The reason Trey isn’t a house hold name is because, unfortunately he’s been stuck behind a Top 5 TE in Zach Ertz. The final position I must address is guard. I would love to have Andrew Norwell, but based on all reports his market will be way too high compared to team need. With that being said, I will go after and sign Justin Pugh. This signing makes so much sense for multiple reasons. First, Justin played for coach Marrone at Syracuse; second executive VP Tom Coughlin had him during his time with the Giants. The final reason for signing Pugh, he is a clear upgrade at guard over Omameh but he also has the ability to swing out to tackle. The 2018 NFL Draft has arrived. Heading into the draft the Jaguars have their entire starting defense intact with the exception of Posluszny, who has been replaced with the younger tackling machine Blair Brown. With our moves during free agency, the Jaguars only real need for the 2018 draft is WR. Despite all the talk from national media about how weak this WR crop is, I’m fully confident the position can be addressed during this draft. For the 2018 draft I have zero concerns for the defense; we can add depth in the latter rounds or via undrafted rookie free agent(s). I will be going all offense to help Blake Bortles continue to develop. 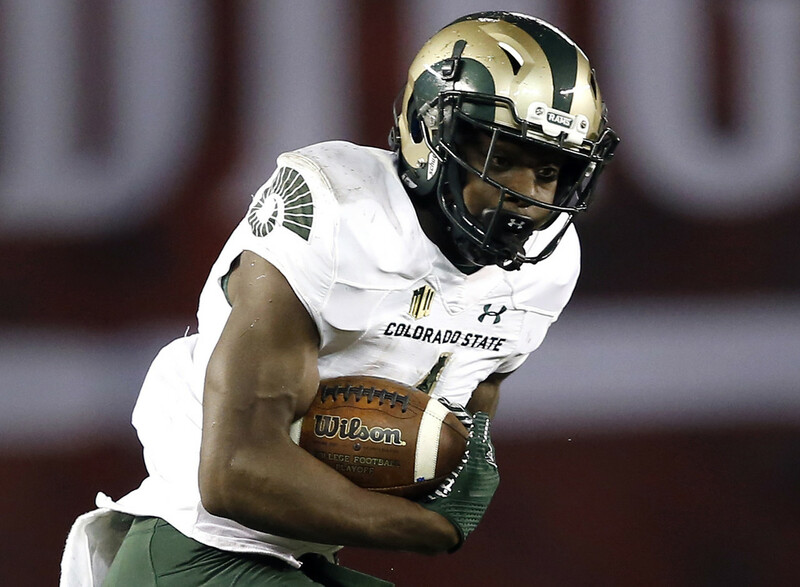 Round 1 (29th) WR Michael Gallup, Colorado State – Michael is an extremely underrated WR who is a good route runner, has the ability to win 50/50 balls (AR15 esque), physical run blocker, and when the ball is in his hands he looks like a running back. Compared to others Michael’s stiff arms are on another level! Round 2 (61st) TE Dallas Goedert, South Dakota State – Dallas is a big body, 6’5 giving Blake another receiving option. He has the body to develop into a good run blocker with the help of Mercedes Lewis. Even though we brought in Trey Burton during free agency I still target a move TE high in the draft. The reason being, one of the most difficult offenses to contain was that of the Patriots with Rob Gronkowski and Aaron Hernandez. The selection of Goedert allows offensive flexibility for Nathaniel Hackett beyond belief! Round 3 (93rd) WR Daesean Hamilton, PSU – We must add another physical WR, Daesean fits that mold perfectly! He’s also a great route runner, who also has the ability to win the 50/50 throws. While at PSU, he played in a run first system showing exceptional run blocking for top rusher Saquan Barkley. If I was in charge of the Jacksonville Jaguars these are the moves I would make and why. I truly believe with these moves we could become an almost unstoppable offense. We would have the flexibility to run or pass out of any formation whether it’s a 3 TE set with fullback to an empty set with 1 or 2 TE’s. Now you add that offensive flexibility and capability onto a Top 5 defense (arguably number one) I don’t see any reason a repeat of last year or better would not be attainable. Stay tuned to Couch Potato GM for more front office takeovers, draft profiles, draft position rankings, Top 50 prospects and much more! If you love the NFL, and can never have enough take a seat on our couch, kick your feet up and enjoy.